Joe Wilson is an award-winning illustrator based in England specialising in highly detailed, hand-drawn illustrations and print. Working with a combination of pencil, ink and digital colour, Joe's work takes form as a hybrid of the traditional and contemporary. Here he explains his process for designing Sally Magnusson’s The Sealwoman’s Gift. From these thumbnails it was decided that the illustration would be a stylised land and seascape, which transitioned from the cold waters of Iceland on the front, to the warmer climes of Algiers on the back cover. Once this was decided I could start to plot out the cover in more detail. This is the way most of my work happens, and at this stage I am working in pencil only. I like to produce a very tight pencil drawing which helps me in the following stages of the artwork, but also gives the art director and the publishers a really clear idea of how things will look at final stage. It’s one of my favourite parts of the process as I get to spend more time working on the details and things come to life a bit more. As the cover started to take shape mainly as an Icelandic seascape, I included a woman’s head intertwined within the waves. This became the focus of the cover in the end, and, I think, provides a nice air of mystery and intrigue. The back cover focused on Algiers and includes a ship typical of the time and location, and a landscape reminiscent of the buildings of that time. I pulled some reference for this but obviously correct reference is hard to find. I added some smaller details throughout the cover and also on the French flaps and after a couple of small edits I was approved to move to ink and colour. I ink my drawings by hand and then scan into the computer to add colour digitally. Our colour direction was very much led by the subject mater and it was a case of trying to meld the blue-greens of the Icelandic sea with the warm orange hues of the Algerian coastline. I felt that the stylised sea offered me a way to delicately introduce the colours to one another without a jarring change, and the spine came in handy to help navigate that change. Sara and her team worked on the type for the book which resulted in a subtle, simple and delicate finish utilising both the blue and orange of the illustration. The last piece of the puzzle was to design some basic endpapers that give the book a nice consistent finish. These were produced by creating a repeat of the wave design from the cover illustration and introducing some seals swimming through. 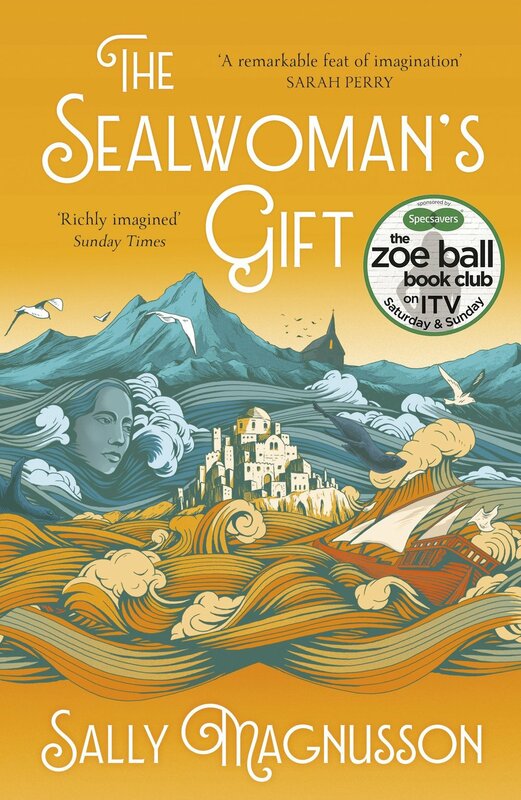 It was a really lovely project to be involved with, and after release it was selected for Zoe Ball’s book club, so we produced a special cover for that paperback edition which incorporated the whole illustration on the cover.